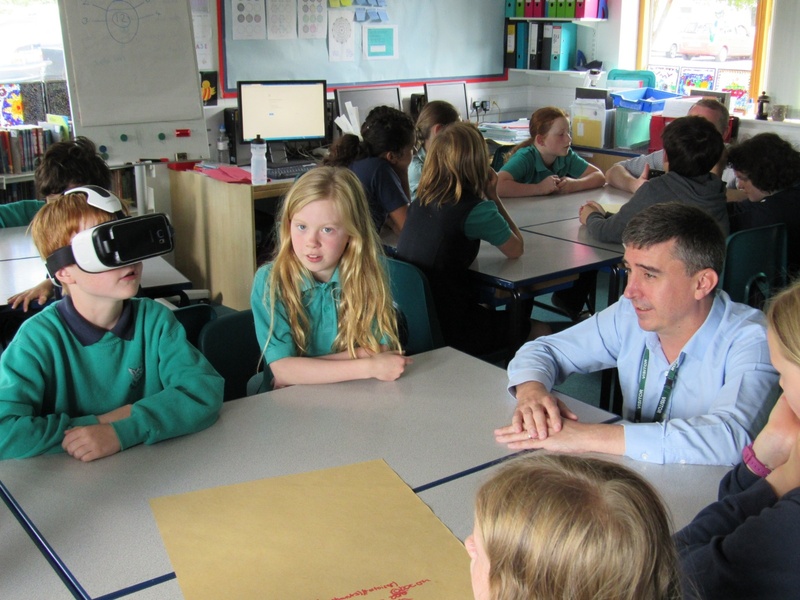 Last Monday we descended upon Foxton Primary School to present Virtual Reality to years’ 5 & 6. Taking with us Google Cardboards, two Samsung Gear VR headsets and a couple of generic mobile powered headsets. A few hands tentatively went up, one answer summarised it best “Virtual Reality uses goggles to show you things that aren’t really there but look like they are.” In essence, this is what Virtual Reality is, it’s immersive 3D environments that allow the viewer to be taken somewhere completely different to their present surroundings in reality. Another answer “it’s Rollercoasters!” which makes sense because at the moment the most common use of VR has been roller coaster applications in the app stores and theme parks such as Alton Towers advertising their Virtual Reality roller coaster experiences. Then we asked; “Who here has experienced Virtual Reality before?” No hands this time, which was a little surprising for us as although this technology is only just going commercial, 360 videos have been available on YouTube for nearly a year. The best reaction of the day came from one Foxton primary year 6 pupil, who said he had never been on a roller coaster before, so we let him try a Virtual Reality roller coaster we had built originally for Nestlé Cereal Partners. He was absolutely enthralled, and completely absorbed by it, arms in the air trying to catch the virtual cereal! 1. Field Trips – similar to our previous blog post about school students who took a Virtual field trip to Mars, students will be able to take virtual field trips to explore historical sites, museums, galleries, different geographical locations much more easily and readily than before. 2. Training – specialist training which has not been available in schools and sixth form colleges before, students will be able to learn in greater detail. 3. Recruiting – students aged 16+ will be able to explore their future university campuses in full 360 from anywhere at any time. Universities will be able to provide not only virtual tours but lecture examples, show what campus life would be like, virtually meet professors. 4. Design – Irish primary school students are already using CAD to recreate local historical sites to put in VR and explore. 5. Collaboration – students can collaborate with other students across the world, work together on bigger projects, knowledge share, and improve their language skills. This is a generation of children who won’t have known life before the iPhone, but they will remember when they first tried Virtual Reality and what it looked like in its early adoption stage.